AutoMatte is a utility to help with 3D compositing, by automatically batch pre-composing RGB multimattes into individual pre-comps with a transparent background. This allows you to use the mattes as adjustment layers, as well as sources for other plugins. 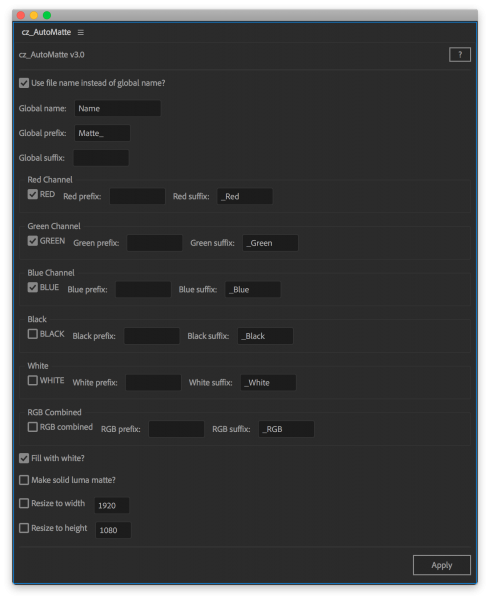 AutoMatte allows you to resize each new pre-comp, as well as rename the file with global and per-channel prefixes and suffixes.